This is my story, and many others’. Every couple that Fred & Ginger ever played on film epitomizes perhaps the greatest possibility of partnership dancing: that the chemistry two people share on the dance floor is the chemistry two people could share off the dance floor. Basically, that the two are linked, that they correlate, that they could possibly be one and the same. In fact, perhaps the very reason why Fred & Ginger were as powerful as they were, on top of all the incredible technical and artistic talent, was because Fred was so good at being likeable and witty, and Ginger was so good at being sassy and strong. That he was so good at charming that force of a woman, and she, well… that she was incredible at showing how much she adored dancing with him, I think. (Something his other partners, thought they might have been better technical dancers, were never near as good as Ginger at pulling off.) It was one of the greatest feats she ever achieved as an actress, because that look on her face when they danced — the joyful laughs in the comedy numbers, the pursed-lips on the fight-and-make-up numbers, and the slightly-open-mouthed look of awe on the romantic numbers — that was, we all knew, the expression of what it was like to be in love with someone. Fred & Ginger’s power doesn’t lie in the dancing, but in dancing AND romance, the inseparable ideal. 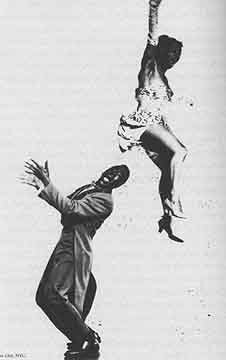 While Fred & Ginger’s characters were reinforcing promises about dancing and partnership on screen in the late 1930s, a man named Herbert Whitey was forming a group of professional Lindy Hoppers in Harlem. Not being a fictional character in an escapist musical, but a living street hustler in Depression-ridden New York, he had a different take on romance and partnership: None of his Lindy Hoppers were allowed to partner with their significant others. Dance legend Norma Miller danced in Hellzapoppin’, and almost always after, with Billy Ricker. Billy’s wife, Willa Mae, was also a Whitey’s Lindy Hopper, but they were not allowed to partner with each other because of their romantic connection. When a Whitey’s partnership did have a relationship behind his back, the others generally looked down upon it. My dance partner Kate Hedin and I were in a committed romantic relationship for six years while we built up our partnership and began our professional dance careers. An incredible dance chemistry first led us to be partners. A six-hour car ride to an event and another one home proved that that chemistry was more than simply dance-related. Almost immediately I began seeing all the advantages to partnering with your significant other. “You have a trusted friend to discuss anything bothering you in the dance or otherwise,” said Joel Plys, who toured the world for many years with his partner and then-wife, and who now, divorced, continues to teach internationally. “Dating and marrying each other has meant much more time together and we have really become efficient with how we work together,” said Joel Damoe, partner and husband of Melanie Myers. Overall, it’s understandable that, the Fred & Ginger fantasy aside, many dancers have faith in the idea that, in the perfect romance, our significant other can also be our dance partner. If you can compromise and work things out in your relationship, then doing so in a dance practice should not be a big deal. If you love spending time together in your free time, then doing so in a business setting could be easy. In fact, Paul Overton, one of the most well-respected Lindy Hop teachers of the recent era of Lindy Hop, says that for him and his wife (and dance partner), it is a false question to ask how they juggle a dance partnership and a romantic one. I want to mention that Paul is unique in this response out of all the people I interviewed for this essay or have talked to about romantic partnership (which is a lot). Everyone else — those with successful or non-successful relationships, those who are married or only dating, those who are just starting out or professional level — all answered the question naturally as if their swing lives together are in some way different than their romantic life together, that there is a “juggling” of the two. Why is that? Have Paul and Sharon found a way of looking at the two so that there is no competing or juggling to be done — a more harmonious mental perspective than those who imagine romantic partnership and dance partnership coexisting, sometimes supportive, sometimes conflicting? Do their personality types and personal history (i.e., that when they were dancing it was a much less competition-focused scene, that they have never partnered with anyone else, that they were married before they were dance partners) help influence that way of looking at it, whereas other partnerships won’t necessarily find it natural to work that way or look at it that way? Or, do more people think of it the way Paul and Sharon do, and it was just that the phrasing of the question made them think of it in those terms? In contrast to the Fred & Ginger screen fantasy, there is the reality that there are many different types of people, and the exponentially more types of relationships those produce create dynamics that may or may not gibe with that utopian idea. And it’s not a bad thing. It’s simply a fact. It’s a fact that just because you are intimately compatible with someone, it doesn’t mean you’ll automatically be good dance partners. It’s a fact that even though you may have a healthy, supportive relationship, it doesn’t mean you and your significant other have the types of personalities that work well sharing a serious hobby to the extent that your success in said hobby becomes dependent on each other. And it’s a fact that some people can devotedly love each other till death do them part, presuming that they never go into business together. It can be complicated when people have different priorities, especially since people are often perfectly justified in having their priorities the way they wish them. Think again of the example couple above, with one person who desires to work as hard as it takes to compete at a national level, and the other who wants to be a good social dancer and local teacher — those are both perfectly fine goals to have. But if such a pair wants to remain a dance couple and is honest about their priorities, there is no answer for both that doesn’t involve some kind of compromise. In my few years as a traveling swing dance instructor, I’ve seen a wide variety of desires in dance couples around the world. I’ve seen some couples where I suspect one partner is caring as much about swing as the other simply to support their loved one — in a way, trying to convince themselves they care about swing dancing as much as their partner does. I’ve seen couples in my private lessons who, when asked individually what their goals were with dancing, surprised their partners by what they said — they obviously had never mentioned them before. I’ve seen some couples take every vacation day from their job for swing dancing purposes, and felt the decision wasn’t unanimous. I’ve seen some couples who actually want the same thing, but don’t agree on how to get it; some who want the same thing and yet don’t want to work for it; and some who simply don’t know what they want. The question of priorities especially resonates with modern international instructor Joel Plys. Even if you do have the same investment in swing as your partner does, it doesn’t mean you both work on things in the same way. When asked what guidelines or rules they had developed in their practicing, Laura Glaess of Mike & Laura mentioned, among several things, understanding each other’s own needs. Some people need repetition ad nauseam (me) in a practice room to change something in their dancing, whereas others simply need social dancing (it’s okay to hate these people). Some people need to come up with their own answers to a problem, even while their partner, who is pretty sure they have the answer, has to stand there patiently and start to smoke at the ears, etc. Some people need to feel things in order to understand them, whereas their partner might need to see it, and this subtle difference in learning, if the partners don’t understand it, can cause a lot more frustration than you would expect. These types of people can still build an incredible life together; they just may be surprised at how hard it is to keep a swing dance partnership fun and with low Kleenex costs. I think one very important aspect to all of this is the idea that relationships with significant others are based, at least in some part, on confidence, stature, and self-image — we love someone not only for who they are, but for who we are to them. A person instinctively wants to be attractive to their significant other because it helps them reinforce that idea in themselves and cement it into reality. For many people that means being self-assured, competent, and, basically, not looking like an idiot. Unfortunately, a good portion of getting better at dancing means looking like an idiot. And feeling like one. Now, let’s say, like many of us, you’re prone to self-esteem issues. Now, all of a sudden, an hour-long practice with our loved one is an hour where we feel we can’t do anything right and we often look and/or feel like an idiot. And it certainly doesn’t help that dancing is so personal — meaning, a lot of how your dancing operates is directly linked to the specific way your body is and how you want to broadcast yourself. People with healthy self-esteem can look realistically at the world around them, and that’s a very helpful tool for developing skills and working successfully with another person. But, very few people in the world have healthy self-esteem all the time, and therefore that realistic view. I know it’s been one of my battles. And, among professional teachers, I’m not alone. There are differences in dance philosophy (one partner might want counterbalance as a default in their Lindy, the other might not want it at all in their default Lindy; one partner might think showmanship is the ultimate goal of Lindy, the other, social partnership). Differences in how exciting practice is supposed to be (one might think practice is a necessary boredom, another might think it’s supposed to be fun). Differences in how you handle bad competitions (one person may need to talk about it afterwards or brood, another may need to not think about it and go off and dance). Differences in how you show frustration (bottling it in, needing to take breaks, needing to push through, throwing things). When we bring all these pieces together into a whole, it’s easy to see how working on dancing is a great deal of problem solving often very difficult tasks that make us often feel confused and incompetent, and that, on top of it all, are dependent on humans who are never going to be 100% consistent. (For instance, every dance partner in existence has had something go wrong, have had it pointed out that it’s their fault, and can’t completely convince themselves that it is.) When you’re romantically involved with your dance partner, that only exacerbates the emotions felt in these situations. After all, one could say that a loved one is someone around whom you can’t help but be truly yourself — both good and bad. And all of these things are exacerbated when competition comes into the mix. It’s a drive that feels natural to us, and therefore once a dance partnership enters the realm of competing together, it tends to involve more drive on the part of one or both partners, more emotional dedication, and the capacity for more stress and anxiety. In either small or big ways, competing can make it harder for people to compromise, or be patient, or communicate healthily with each other. It can make people more frustrated or greatly affect their self-esteem. It can be managed, of course, but it’s yet another factor involved. The other side of all of this equation, and a huge one, is what’s happening in the romantic relationship. I’m fairly certain that every marriage counselor, priest, and rabbi would agree that if a relationship doesn’t occasionally have some conflict, issue, or at least honest confrontation, then there’s something wrong. The problem with swing and romance is that the one can all too easily bleed into the other. In fact, the swing dance relationship can suddenly become the symbolic expression of all romantic woes. Out of the dozen or so wedding sermons I’ve heard in my life, I was occasionally happy to hear one where the preacher started off talking about how great love was, then would suddenly lay down the reality of how much work and time and fighting and patience and forgiveness and compromise went into every successful marriage. Looking around, I’d notice the obviously happiest, longest-together couples I knew would have knowing smirks on their faces, or nod slightly. From behind, the postures of the bride and groom, however, were suddenly slightly tense. What do you fight about in dance practice? Like in a marriage, that knock-down, drag-out fight is not actually about the proper way to load the dishwasher. Sometimes it’s about dependency. Sometimes it’s about respect. Sometimes it’s about listening. Sometimes it’s about fear. Sometimes it’s about something totally and completely unrelated. Basically, let’s say your swing dance partner is different from your romantic partner. If things are tricky with your romantic life, you can go to swing dancing for a brief escape to get a change in perspective or de-stress. Or, if things aren’t working with your swing dancing, you can retreat to your romantic partner for escape. But if your romantic partner is the same as your swing dance partner, then there’s nowhere to go when you have problems. However, some would argue the benefit to this is that no escape means you are always forced to confront your problems. Since conflict and confrontation are a natural part of both romance and swing partnerships, I think in this case knowing is at least a third of the battle. Those who are embarking on combining their romantic partnership and dance partnership should probably just realize that (1) there will come a time, perhaps many times, when it is not going to be easy, especially if you are very competitive by nature, or desire to compete and make a name for yourself (which adds tons of stress and possibly mismatched priorities if your partner isn’t as competitive). It’s good for both partners to know this is perfectly normal. And, (2) it is both healthy and realistic to realize that there may come a time when the swing relationship or the romantic relationship will have to change in some way for everyone’s betterment. This could mean many different things. I’ve seen a few couples who have decided that they needed to take a break from competing, or traveling so much, in order to be happier. I’ve seen others who decided to stop partnering all together. Occasionally, people decide that it is the romantic part of the relationship that needs to change. For dance couples who are only dating, this is, as Laura mentioned, a possibly healthy option. Other couples, especially those with the level of commitment found in marriage, might look at it differently. 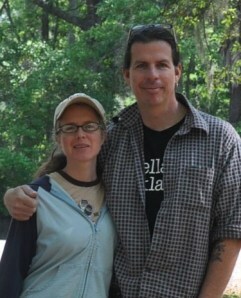 Their steadfast dedication has served Mike and Laura well. But even these partnerships are not absolved from change. Paul Overton and his partner Sharon, for instance, were one of the most influential international couples in Lindy Hop in the early 2000s. 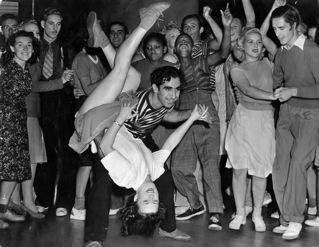 However, as popular dancing styles changed, they soon found themselves with less work and had to confront what it would mean to continue making a living as swing dance instructors. Based on what we’ve discussed here, the ideal dance & romantic partnership occurs when both dancers are invested the same amount in their romantic relationship and swing, both people work on dancing in complementary ways, and both people have incredible confidence. As you can imagine, this is pretty rare. And yet, there are still many very happy, flourishing dance romantic couples. How do these people make it work? Almost every partnership I’ve ever talked to (even the ones that ultimately didn’t work out) has mentioned communication as one of the most important parts of a successful partnership, romantic or swing, and especially both. (For instance, one of the best things you can do for your partnership is, when you recognize one of the differences mentioned above, talk about it with your partner.) But saying “communication” is the answer is still vague and doesn’t help much. It’s not only that you communicate, but what you communicate. Another importance is when you communicate. And briefly remember how Laura Glaess knows that it’s best to wait until her partner has tried something a few times before starting a discussion about how it’s going, or how Chelsea Lee has learned to resolve problems only generally before bed, and wait until the morning after to see what’s still lingering. Then there’s how you say it. If this has happened to you, on either side of the story, you are not alone. At all. Here Paul touches upon two other common answers to the question of how romantic dance partnerships keep things happy and productive: patience and compromise. Patience is not easy for some people. For instance, recall that Laura Glaess had to learn to be patient when working with her husband and dance partner to give him time to work through some things on his own. Impatience is a battle common among followers, I think, when leaders are working on the technique of a move and require them to simply follow. In these situations, the leader is very mentally active trying to execute all the proper leads to accomplish the task — he probably doesn’t have much of a problem with patience. Whereas the follower’s goal is simply responding. The followers, therefore, first, don’t have a whole lot of mental things to keep them busy, and, second, are in a position to know relatively well where problems are arising and what feels “wrong” about the move, as they are the object the move is being acted upon. Patience takes many forms. Patience in the short term to let your partner have a few more tries of searching for answers themselves (partners don’t even have to come up with the answer; often it’s just enough that they are given a chance to search for the answer themselves). Patience in the long run that it takes a lot of hard work for many years to get very good at swing dancing. Patience not only with your partner, but with yourself, to allow yourself the time to process and implement the things you’re working on. Then, there is for some, the trickiest one of all. “When your life partner is also your dance partner there’s a lot of negotiating that has to go on to keep both people happy,” said Chelsea Lee. Compromise is tricky because there are certain things people don’t want to compromise, and/or shouldn’t, and there are other things people should and perhaps may have to compromise in order to work together with someone, and figuring out what those things are isn’t always easy. To do it in a healthy way, it takes a lot of self-awareness, self-reflection, communication, and, unavoidably, trial and error. In fact, this is something that non-romantic partners can learn from this essay. Even without the romance, dance partnerships can be hard enough, and require exactly the same skills a long-term romantic relationship does. *** The common line through all healthy partnerships I’ve been a part of or witnessed is respect. Two people have to have enough respect for each other and themselves to get through the frustrating moments, to work through their difficulties, and to look towards the end goal. They have to show that respect in communication, compromise, and patience, and, occasionally, improvising. If they do that, they’ll be able to express themselves, support each other, build something great together, and have a ton of fun doing it. Sounds a lot like swing dancing. 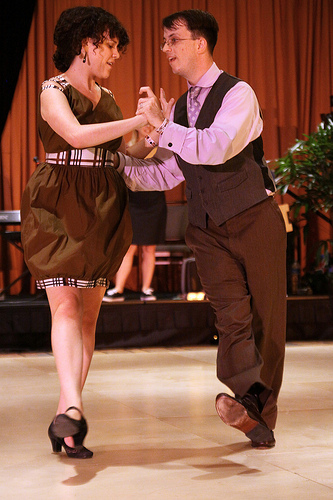 Aside from the large areas of communication, patience, and compromise, there are some other interesting ways partners have learned to balance their swing dance partnerships and romantic partnerships. In order to change the nature of how they work together, Megan observes the way Alex interacts with other partners or dancers he works with. She then makes mental notes of how his other partners react to situations that would be potentially inflammatory. She then makes an attempt to react the way his other partners react. It’s a fascinating way of confronting this problem, that sometimes our comfort in such close relationships can in some ways keep them from being productive. It also reminds me of, personally, one of the reasons I think my partner Kate is one of the greatest I could have for my personality type. The only reason my partner and I survived in a relationship that combined business, romance, and dancing is because I happened to have been very lucky in my partner. Because I certainly wouldn’t have done it if left to my own devices. We White men (by which I mean, the men of the White family, my ancestors) are emotionally powerful men. We’re passionate. Filled with smoldering fires. We yearn. We brood. We’re known to do quite a lot of brooding, in fact. For instance I’ve spent entire years of my life listening to depressing music and looking out of windows. So, even though I’m out of college now and a lot more positive about things, there were still times in years past when, if a move didn’t go well in practice, I’d become all tumultuous and do everything short of ripping my ascot off and throwing things at mirrors. This kind of environment was not the most conducive to productivity, not to mention rather rough on the furniture. Joking aside, Kate enjoyed it greatly, and there were many good things about her learning experience there — which I have benefited greatly from. At this cutthroat music conservatory, Kate learned a very important phrase: “You can’t be enemies and play music together. At least, as long as the music lasts.” A string quartet is comprised of four people who must support each other. Imagine having one incredible dance partner and doing a dance together. Now imagine if Lindy Hop somehow involved partnerships of four people connected to each other. You know how rare yet incredible it is to find the one partner you love to dance with, let alone two more who feel the same way about you and each other. So, throughout her music career so far, Kate has witnessed several quartets of four incredible people break apart because of romantic relationship problems making their way into practice. For this reason and others, Kate and I decided from the beginning that we would try to separate our romantic relationship and our practicing one. This meant that when practice time started, there would be no kissing. No pet names. No existence of our life together the other 22 hours of the day. When practice ended, we could get back to dating. Easier said than done, as you can imagine. Especially for me (the White passion and whatnot). Before I realized it, strange things would creep up. What would begin as a simple “I don’t think you’re matching my compression on that turn” would end up including such additional evidence as “And you NEVER vacuum.” (Original complaint substitutions have been added to protect the privacy of all parties involved.) But, Kate was very professional about it, and I began to take after her. Overtime, it became not only easier, but less stressful overall for me, personally. I soon got used to the idea that my dance partner was a slightly different person than my romantic partner, and it made me appreciate both aspects of her more. Is this the answer for everyone? I doubt it. But there are probably a few out there who might find it highly beneficial to give it a try. And, I know this method, without a doubt, made things a lot easier for me last year. 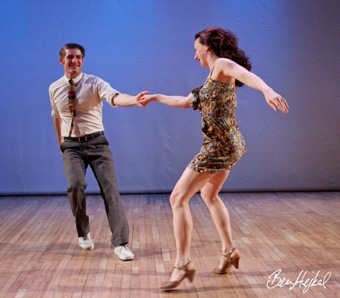 In March 2011, after six years of dating and dance partnering, and two years of full-time swing dancing work, Kate and I decided to go our separate ways, romantically. It wasn’t because anything happened; it was because nothing was happening: We weren’t ready to take the relationship further, and figured that was a sign. Though we decided to end the relationship, we both admired each other and liked what we did together so much that we wanted to continue teaching, dancing, and building our dance partnership together. We knew it wouldn’t be easy for many reasons. The obvious one was the personal difficulty of transitioning from a romantic relationship to a platonic one and still seeing each other all the time and working together. Kate’s idea to divide our romantic relationship and our dance partnership from the beginning made this infinitely more easy. Aside from a few rough ones during the transition phase, practices hardly changed at all; in fact, we had already gotten years of practice in keeping the relationship professional, so I’m certain it actually helped the transition. Now, more than a year later, we are both in a very good place both in our personal relationship and our partner relationship. And we both have a new challenge in our lives: dating in the world of international swing dance instructing. Next in this series, we’ll discuss that challenge. But before we do, take one last look at the Fred & Ginger picture at the beginning of this article. In the picture above, Fred and Ginger have had a snapshot taken at a moment during a scene in Roberta. They look miserable and pissed off at each other. 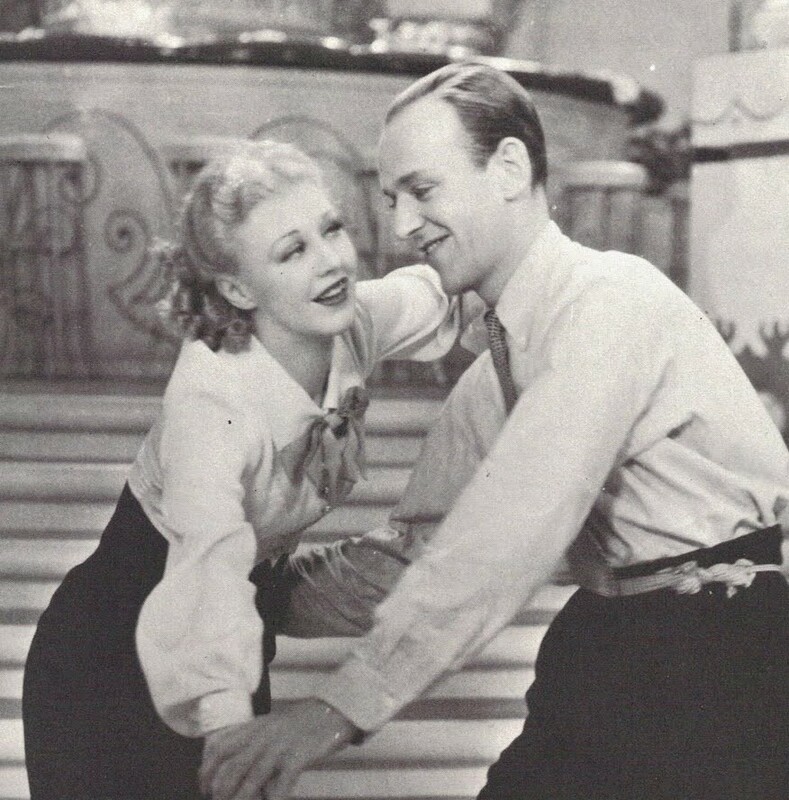 See this moment in the context of the actual film, however, and you realize it’s merely a shot taken in transition — the scene itself is overall full of life, joy, and the two, though they give each other a hard time, are actually quite fond of each other and of course, share that Fred and Ginger chemistry on the dance floor. If you just stared at the picture for minutes on end, you’d get a very skewed look at the relationship they have in the scene. This article itself concentrates a lot on the hardships of romantic dance partnerships and ways of coping with those hardships. It would do well, though, to remember that such things are just a snapshot in a much greater, joyful scene. I would like to extend great thanks to those who helped contribute to this article: Kate Hedin, Paul Overton, Chelsea Lee, David Lee, Laura Glaess, Mike Roberts, Joel Plys, Laura Keat, Joel Damoe, Melanie Myers, Bethany Powell, and Megan Damon . UPDATE: 2:07 p.m. 7/11/2012 — Just as Chelsea Lee found that problems look quite different the morning after, so have I realized this article does. I’ve gone back and carved a few clunky edges off, sanded down some bumps, and applied a little lacquer. Nothing of substance has changed, only some word choices (which, to us writers is everything of substance, but you know what I mean). If you, for some reason, want the original published version, just email me and I’ll send it to you. Also, an apology to my editor, Chelsea; I tried out a new way of fixing the corrections in Word, and realized on re-reading that some of them didn’t stick. [*] — Which is not helped by every dance movie ever. ** — In fact, it’s hard to concentrate on how sophisticated and difficult it is, because their effortlessness and carefree acting keeps sucking you back into the fantasy that it’s all a skip in the park to them. It’s one of the most important traits of their dancing and increases the sophistication and difficulty even more. *** — It’s still up in the air how often he wore long underwear; possibly not very often, possibly his entire filmed dancing career: being a knobby, lanky man, the long underwear helped give him some bulk and soften the points of his elbows and knees. He was very conscious of how he looked. **** — Also, I think it’s important that the characters Fred & Ginger played, though often two-dimensional and contradictory in nature (for instance, Fred creating such a likable and smart character in look and delivery, but his dialogue being often mean and/or not very intelligent) still seem much more normal than the actual Fred Astaire and Ginger Rogers. From what I’ve read about them, Fred could be incredibly distant, and Ginger was what could only be described as the kind of girl who grew into adulthood with her stage mother as her best friend, a person who for religious reasons never saw a doctor or visited a hospital (even after suffering a stroke in her old age), and who had five husbands, most of whom lasted only a few years, none of whom lasted longer than 10. So, being such unique people (each of whom, many people mentioned, were difficult to work with in their own way), they should not be held up as a normal example of partnership and romance. For this essay, I would prefer instead to concentrate simply on the contrast between how hard they worked to get the dancing that looked so carefree in the scenes of their films. Which is symbolically important here. ***** — There’s even the converse situation: People who start off as dance partners, and because that goes so well, decide they must be perfect for romantic partners. It makes sense. You and your dance partner work hard together and have fun doing so. While doing so, you probably achieve both some success and some failure, both of which help bring you closer to another person. Then there’s all the time spent together. Not just in practice rooms, but at events, before and after contests — times spent calming each other down, or hyping each other up — or, after that one competition, finding someplace private to talk about (or not talk about, but knowing still as if it were spoken) each other’s hopes, dreads, and frustrations with this passion we call swing. It’s no wonder partners can confuse that with love since it shares so many things in common with it. It’s also no wonder that some people have realized that what they are actually feeling for their partner is love. Remember freshman psychology, when we heard about the “love bridge” experiment ? This part of the article made me think of it. The bizarre experiment went like this: The experiment was held with men walking across two different bridges. One was a rickety suspension bridge, swaying hundreds of feet above the rocks and rapids, and had low hand rails. The other was a stable, wide bridge with high railings that ran only a few feet above a stream. When walking on the bridge, the men were approached by an attractive woman who asked them to fill out a survey. The woman then gave the men her number “to follow up if they wanted to.” The actual experiment had nothing to do with the survey, but with the phone number. Half of the guys on the shaky bridge called the woman back. Only a small fraction of the guys on the sturdy bridge did. The experimenters concluded by theorizing that the feelings of anxiety turned up by the suspension bridge either led them to relabel their feelings as sexual attraction, or they allowed them to act on preexisting sexual attraction more easily. 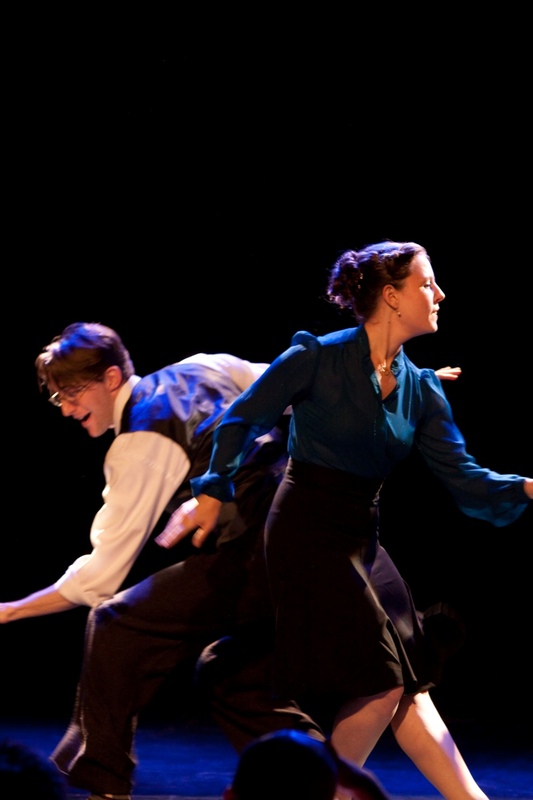 I think swing dance partnerships often offer a similar possibility to the suspension bridge: Since they can bring out so many emotions and dynamics that are similar to what you would experience in a romantic relationship, it’s understandable that those feelings can cross over to romance at some point in the partner relationship, or make it easier for partners to act on underlying feelings of attraction. [*] — And that’s not counting the sway one person will have on another. For instance, the “we must practice every day this week” type of person might make the other person feel like swing is dominating their life, and make them into an “I can only stand one hour of practice” type of person after a few weeks. And vice versa. A partner who doesn’t want to practice as much can cause stress on a person who feels they need to practice in order to get better. *** — Our bodies even try to make losing feel as bad as possible, just to keep us focused on winning; all pleasure secretions are stopped, so you feel the full impact of your exhaustion and pain. And blood leaves the stomach, giving that “sinking feeling.” Can you tell I’ve been watching the Human Instinct documentary on BBC? * — I once heard this advice: In a romantic relationship, leave the bedroom alone. Don’t fight in it, don’t put a TV in it, don’t do anything in it except for two things, one of which is sleeping. It’s interesting to think about the social dance floor holding a similar place of reverence for a dance partnership – it’s made for celebrating what you have together. *** — After having discussed the importance of communication, patience, and compromise, it makes sense that a few couples have told me that being swing dance partners has made them more successful in their romantic relationships. Mainly because working together on swing dancing often puts into tangible form the issues romantic partners have with themselves and one another. And thus, the dance partnership becomes a training ground for solving bigger life problems. Interesting and insightful article. It reminds me of an article about Torvill and Dean (Jayne Torvill and Christopher Dean). These two were ice dance partners but not married to each other. Although they did not teach ice dancing, they practiced and toured a lot with each other. Fred and Ginger never had a romantic affair, it was all business. I think that’s what makes their partnership great. [on her screen partnership with Fred Astaire] We had fun and it shows. True, we were never bosom buddies off the screen; we were different people with different interests. We were only a couple on film. What a wonderful piece of writing, Bobby. Insightful, entertaining and courageous. You should do something more with it – really get it out there. Well done! Fantastic, Bobby! Thank you for this incredible view into those aspects of the dance culture. Er…*these aspects. It’s early. And Wednesday. Well, I was supposed to be researching this morning but got sucked in to this riveting piece. I especially loved the section about Kate. The whole piece is so cogent, and what a great journalistic “voice” you have! I have questions I’ll ask in private! Thanks for writing this, Bobby. Can you please rewrite every textbook? You’re so much better at communicating scholarly wisdom than most. Fantastic article! I appreciate the time, energy, personal insight and research that went into it. In fact, I would venture to say it would be a good talking points piece for future dance/romantic couples considering on making that leap, and maybe save them some time from “learning by trial and error” like a lot of us have. Bravo, Bobby! You have made another great contribution to the world of Swing dancing. 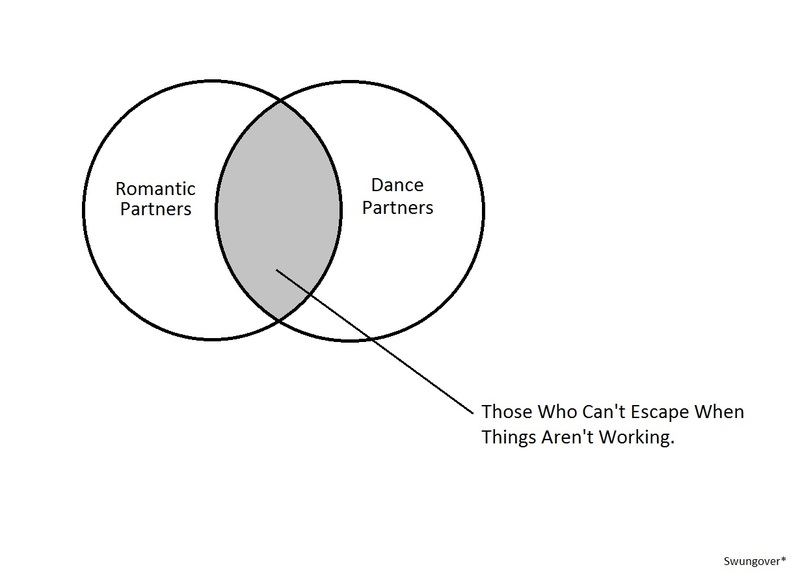 Surely every romantic/dancing partnership must face these challenges. A few years ago, in our first private lesson with Mike and Laura, my partner and I asked how to practice and not have it end in tears. Their advice of understanding and allowing for individual differences has been a great help. I really relate to the three-more-tries thing. I hope that many people read this wonderful essay and find benefit from the many pearls of wisdom contained within. I’m really glad you wrote this. I’m sure it’s a very timely and validating article for a lot of dancers out there. Like me, for example. I definitely learned a couple things. Though I have nothing to do with swing dancing; though I have a romantic partner but he is not my dance partner; though I am on a dance break, I really enjoyed this article and learned a lot about myself. Keep up the good work!!! On balance - Getting where?